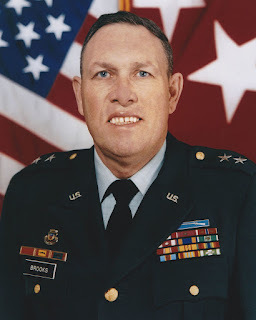 Indianapolis, IN, (March 24, 2018) VRI — Retired U.S. Army Major General Ronald E. Brooks, 80, died peacefully in his home with his family on Thursday, March 22nd. He was the last Commanding General of Fort Benjamin Harrison, Indiana. The City of Lawrence Government Center is named in his honor. Ron was born in Rogersville on September 12, 1937. A husband, father and grandfather, he lived a life of duty, honor, and sacrifice for others and his country. Ron and his wife Drusilla (Muse) Brooks were married for 60 years, residents of Lawrence, and members of Sunnyside Road Baptist Church. Ron Brooks graduated from East Tennessee State University (ETSU) having attended on a football scholarship. He was honored and named “Mr. ETSU” his senior year, and upon graduation was commissioned as a Second Lieutenant in the US Army. He later received an MBA at Butler University. The son of a farmer, Ron loved growing vegetables and sharing them with friends and family. He liked telling stories about hunting and fishing trips, his latest military field exercise, or his largest tomatoes. But most of all, he enjoyed sharing stories about winning important battles on policy debates and strategic decisions that benefited the lives of soldiers. General Brooks’ Army career began as an Infantry Officer at Fort Benning, GA and he later joined the Army’s Adjutant General’s Corps. Brooks served two tours of duty in Vietnam. During his career he also served at Fort Buchanan, Puerto Rico, Fort Rucker, AL, Fort Harrison, IN, Fort Leavenworth, KS, the US Army War College, Carlisle Barracks, PA, as well as in Washington D.C. and Germany. He was promoted to Brigadier General in 1985 and subsequently served in a series of senior leadership roles developing and implementing critical wartime personnel management capabilities and essential support services for soldiers. In 1989, he was promoted to Major General and assumed duties as the Deputy Chief of Staff for Personnel, United States Army Europe and Seventh Army. His military career culminated as the Commanding General, US Army Soldier Support Center at Fort Benjamin Harrison, IN; a post he took great pride in having served there multiple times throughout his career. In this capacity Brooks’ instrumental leadership and direction enabled mobilization successes during Operation Desert Storm and Operation Desert Shield. General Brooks ended his last tour of active duty as the driving force behind the successful transition of Fort Harrison from an active duty Army post to a thriving civilian community. This enormous achievement spurred economic growth for the community of Lawrence, fostered the establishment and growth of residing US Army Reserve and Indiana National Guard units, and secured recreation and support services for military reservists, national guardsmen, military retirees and the local community. After retiring from the military he continued to serve veterans in the National Headquarters of the American Legion as Executive Director, American Legion Marketing Services Group. New Castle, IN, (March 24, 2018) VRI — American Legion Post 343 is planning a salute to veterans of the Vietnam War era. 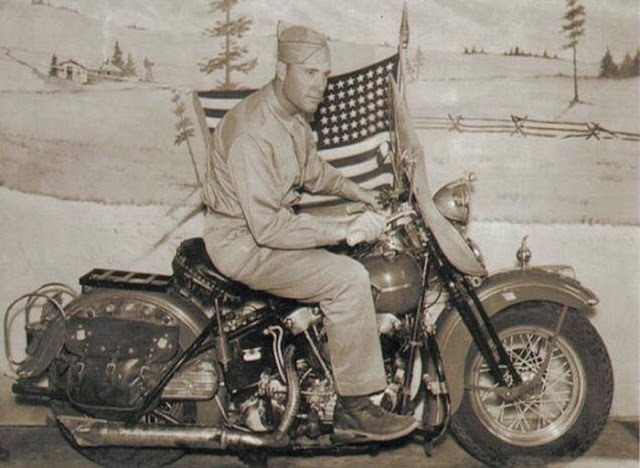 The post, located at the corner of North Jefferson and East Falls streets, will hold a program from 11 a.m. to 2 p.m. March 29 to which it is inviting the public, but particularly all those who served their country during the years 1955-75. There is no charge, and a lunch will be served. Veterans who were deployed to Southeast Asia during that period will be asked to stand to identify themselves, their branch of the military, and when and where they served. Also Thursday, VFW Post 315 will hold a luncheon from noon to 2 p.m. at its 1820 E. Washington St. facility. All men and women who served in the military at any time are welcome, along with their spouses. Those who were deployed can get their first membership free. Both programs are planned to coincide with National Vietnam War Veterans Day, which was signed into law last year by President Trump. March 29 was chosen for the day as it is the last day that troops were withdrawn from Vietnam in 1973. 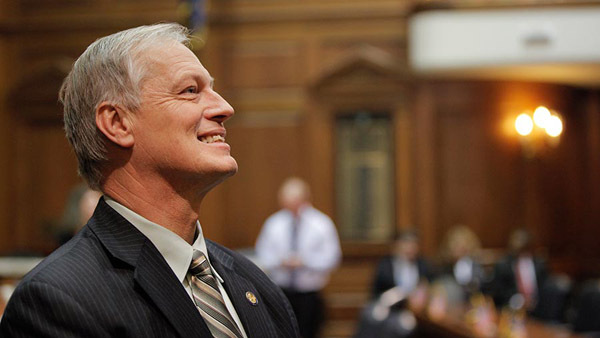 The bi-partisan bill creating the act was sponsored by Pennsylvania Sen. Pat Toomey and Indiana Sen. Joe Donnelly. 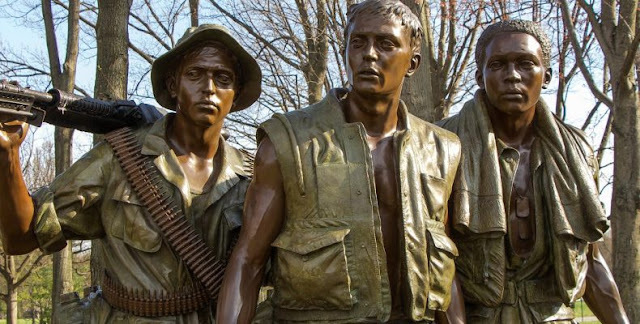 The day has been observed informally prior to becoming law, with President Nixon choosing March 29 as the first Vietnam Veterans Day in 1974, and President Obama issuing a proclamation for a Vietnam Veterans Day on March 29, 2012. Rensselaer, IN, (March 21, 2018) VRI — Members from the local Indiana chapter of the American Veterans Motorcycle Riders Association visited the Rensselaer Library on Monday, March 19. 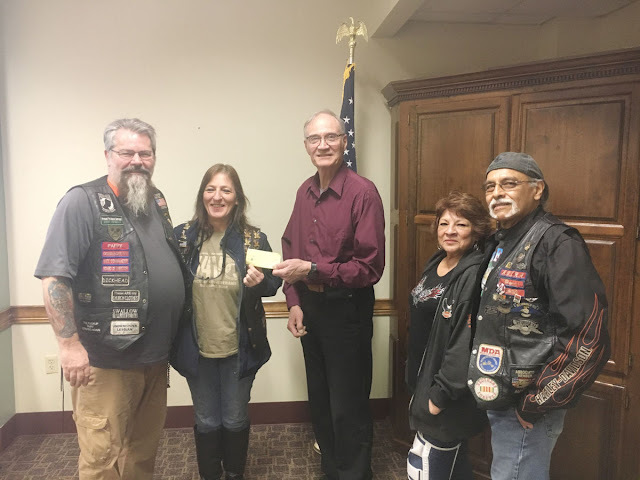 The group had arrived to deliver a donation check for the upcoming mobile Vietnam Memorial Wall event to the Jasper County Veterans Service Council. 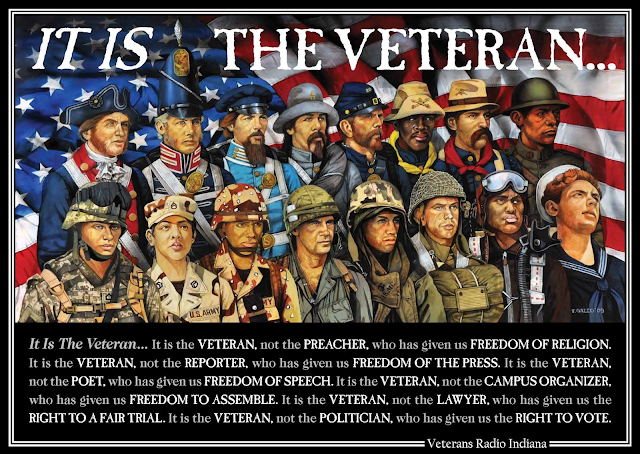 One does not need to be an actual veteran to join the group, but they do need to be passionate about helping them. Paul "Pappy" Day, the chapter's Commander and an Army veteran of including Desert Storm, said that a member named Toby Stanley was largely responsible for making the donation happen. Stanley is notably not a veteran himself, but he wanted to help the cause after seeing information about the event in a newspaper. "We've done donations for the traveling wall before," Day said. The check was delivered through Pat Donnelly, an assistant and former officer for the local Veterans Service Office. Donnelly said AVMRA member Gina Seitz had contacted him via email about making a donation. "At the time, she said 'I know we'll have at least $220," Donnelly recalled, "which would have been a nice donation." The group ultimately handed Donnelly a check for $1,220. He had only learned how high the amount was after the group arrived at the library and later joked about nearly fainting when he first heard the total. Jeffersonville, IN, (March 20, 2018) VRI — Three years ago it would take everything John Wells had to muster the courage just to leave his St. Matthews home. 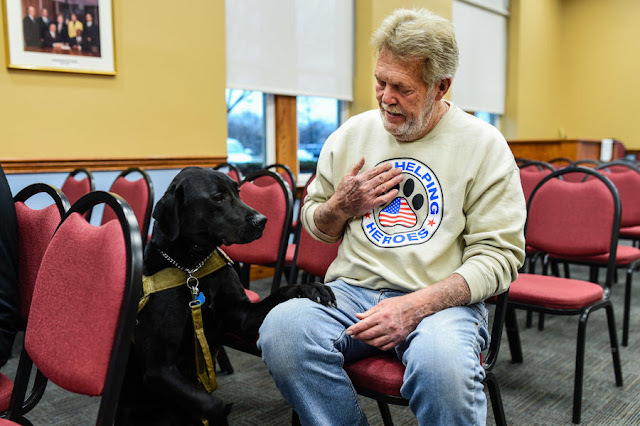 On Monday, the Vietnam War veteran stood before the Jeffersonville City Council — his faithful service dog, Johnny Cash, at his side — to lend support to an organization and an event close to his heart. Wells was the second recipient of a service dog from Dogs Helping Heroes, a Clarksville, Indiana based nonprofit organization that pairs wounded military members and first responders, or "heroes," with service dogs. "It's been a big change for me," Wells told the council. "It's just awesome what Dogs Helping Heroes has done for me." "I wouldn't go out and do what I'm doing right now." What Wells was doing was supporting a group of Southern Indiana high school students with Leadership Southern Indiana's NEXGEN program that has organized an inaugural dog walk at Big Four Station Park to raise awareness, and funds, for Dogs Helping Heroes. Louisville resident John Wells with his service dog, a Labrador named Johnny Cash. While the group was seeking financial support from the city for the dog walk, the bigger inspiration was to spread the word about the organization. "It's just really to raise awareness, because not a lot of people know about it," Lauren Jacobs, 17, a junior at Jeffersonville High School, said before Monday's meeting. "This is a pretty awesome cause, and hopefully more people can know about it and become aware of it." Council president Lisa Gill told the students that the council would take their request under advisement, and she thanked Wells for his service and for appearing before the council. 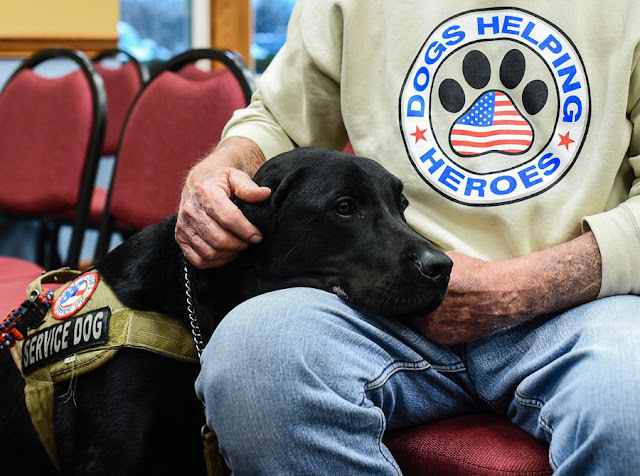 The goal of the April 7 event, which begins at 2 p.m., is to raise $40,000 to provide 10 heroes with a service dog. It's a big slice of the organization's overall fundraising goal of $80,000 that would provide 20 service dogs for veterans. A service dog can cost as much as $30,000 — "a pretty hefty price for someone who has risked so much," Jacobs told the council — which is where Dogs Helping Heroes steps up. The organization uses rescue dogs, with inmates performing a portion of training, which significantly reduces expenses while providing veterans and first responders a service dog at no cost. The veterans and first responders suffer from post-traumatic stress, traumatic brain injuries and physical disabilities, with many confined to their homes. Wells, who was diagnosed with post-traumatic stress disorder in 2003, and learned he has Parkinson's disease two years ago, was paired with Cash three years ago this May. "I didn't go out much. I'm still having a hard time going out without Cash," said Wells, 70, who served in the 1st Marines Division. "I never go anywhere without Cash." But there he was Monday, with Cash, and three high school students — Jacobs was joined by Nathan Eckert, 17, a junior at Silver Creek High School, and Adela Zimbro, 16, a junior at Charlestown High School — at his side. David Benson, executive director of Dogs Helping Heroes, said when he first met Wells, the veteran was "literally a prisoner in his own home." Benson arrived late Monday only to find out that Wells stood front and center with his new friends. "Normally John would have been like, 'I'm not going without you,'" Benson said. "He got up and spoke in front of everybody." That's the point of Dogs Helping Heroes, and the April fundraising event — to give heroes the courage to stand up. "What happens is these men and women, many of our heroes, just come back to life," Benson said. "They feel more confident, they feel more comfortable, their anxiety levels drop, because they have their battle buddy with them, they've got somebody to watch their back." "Thank God I got him," he told the council, "because I wouldn't have made it another year." 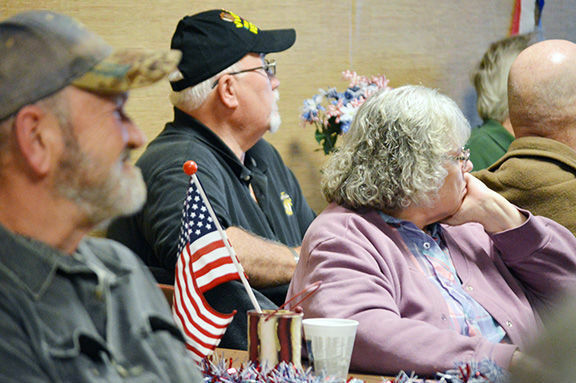 Kokomo, IN, (March 17, 2018) VRI — Veterans who served during the Vietnam War era will for the third year in a row be guests of honor at a breakfast held later this month to honor veterans who didn’t get such a warm welcome when they returned home nearly 50 years ago. The Francois Godfroy Chapter National Society Daughters of the American Revolution and the Montpelier American Legion Post 156 and the Legion Auxiliary will host the third annual Vietnam Era Veterans Commemorative 50th Anniversary Breakfast from 8:30 to 10:30 a.m. March 29 at the American Legion Post 156, 112 W. Green St., in Montpelier. 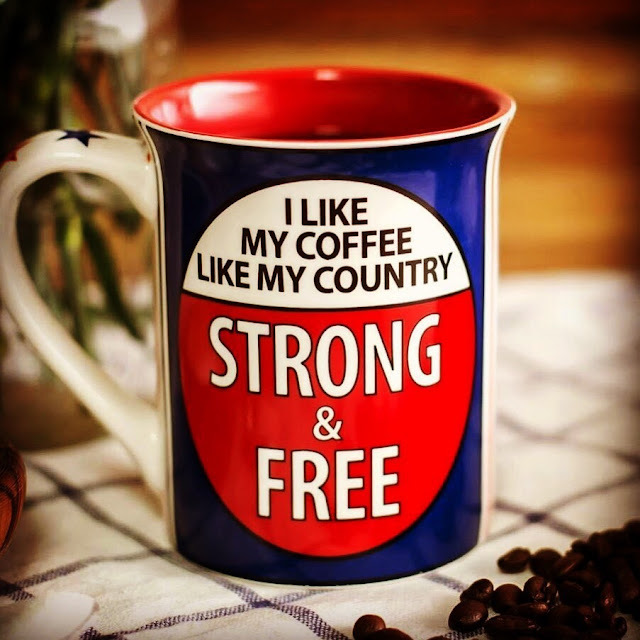 Those planning to attend the breakfast are asked to call the American Legion at (765) 728-5783 between 4 and 8 p.m. by March 26 to say how many guests will be attending. Beverly Furniss, DAR Chapter Regent, said all persons who served in the military between 1955 and 1975 are invited to attend and bring guests. The breakfast will be followed by a recognition ceremony and a speaker. The DAR is one of several national organizations that is partnering with the Department of Defense to conduct the program commemorating the 50th anniversary of the Vietnam War. By presidential proclamation on May 25, 2012, the Commemoration extends from Memorial Day 2012 through Veterans Day 2025. The Commemoration began with the Presidential inaugural event at the Vietnam Veterans Memorial (The Wall) in Washington D.C. on Memorial Day, May 28, 2012, and per presidential proclamation, the Commemoration extends through Veterans Day 2025. The Commemoration honors all United States veterans who served on active duty in the U.S. Armed Forces at any time between Nov. 1, 1955 to and May 15, 1975, regardless of location. The Department of Veterans Affairs estimates that today there are 7 million living Vietnam veterans and 9 million families of those who served in this time frame. There is no distinction between veterans who served in-country, in-theater, or who were stationed elsewhere during the Vietnam War period. To thank and honor veterans of the Vietnam War, including personnel who were held as prisoners of war, or listed as missing in action, for their service and sacrifice on behalf of the United States and to thank and honor the families of these veterans. Saratoga, IN, (March 15, 2018) VRI - (WISH) — Thousands of men and women who served this country now count on the U.S. Department of Veterans Affairs hospitals to serve them. That is why one couple wanted to alert I-Team 8 to a potential scam targeting veterans. David Massey is a disabled veteran with a passion for helping other veterans. He was injured in Army training and since then has depended on the VA for his medical care. Several months ago, he and his wife, Della, started getting calls they thought were strange. “I listened to the recording, and it was a lady stating that she was from the VA and that we should get back in touch with them right away because of a dependent issue,” said Della Massey. But Della and David’s kids are grown and out of the house with children of their own. The couple no longer has dependents anyway. “I knew right then it was fishy,” she said. David also got a call with the recording, but he responded. “I usually don’t answer them, except this particular call came in on a 765 number,” said David Massey. It didn’t make any sense to him — whoever made the call had some correct information about him, but some information was wrong. He did not fall for it, but he’s worried about other disabled veterans. “Disabled vets are preyed upon and I know that, and it’s the guys that have traumatic brain injuries (who) are probably the most vulnerable,” he said. The number referenced (1-877-764-0009) is actually a legitimate number used to verify the status of dependents. However, as with any phone scam the public is warned about, if something doesn’t seem quite right, it is best to validate the source before providing any personally identifiable information. We recommend, in such cases, the individual terminate the call and contact the organization the caller claimed to be. 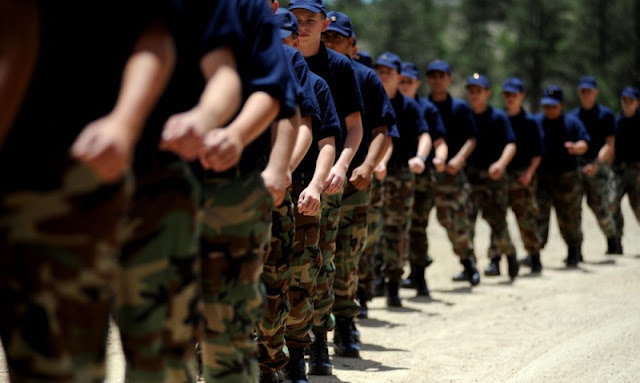 For the Veterans Benefits Administration, Veterans should call 1-800-827-1000. The following letter was sent to artist David Mann. "When I ride my hog at night and the moon is full and the wind is cool against my face, I can feel you riding beside me on your panhead. I can hear your laughter and see that glint in your eyes. God, how I miss you, man. Your friend, Roundman". 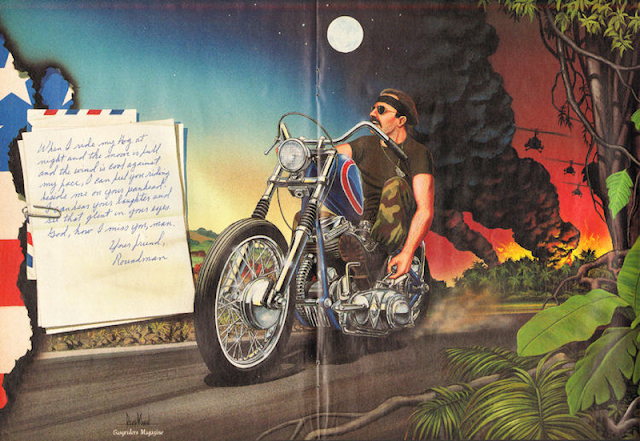 He was so moved by it that he created this painting titled "Vietnam: Letter to a Lost Bro" that appeared in Easyriders magazine. 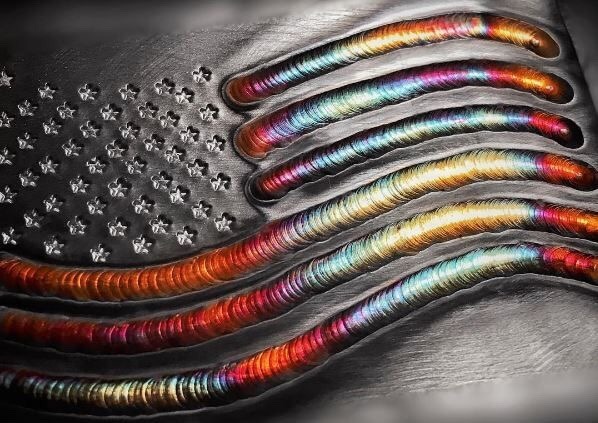 Thanks to Bikers Helping Veterans for this information, you guys rock! 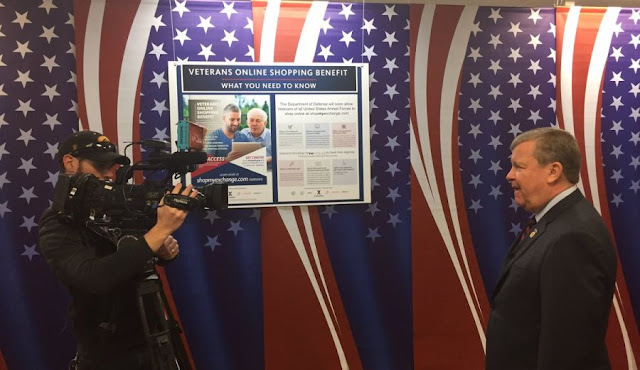 Dallas, TX — Some 18.5 million honorably discharged veterans have a lifetime benefit enabling them to shop online at the Exchange store, marking the first expansion of military exchange privileges since 1990. "The Exchange is honored to open its virtual doors to millions of deserving veterans," said Tom Shull, the Army and Air Force Exchange Service's director and CEO, a Vietnam-era Army veteran. "There are many generations of service members who have not been properly recognized," he added. 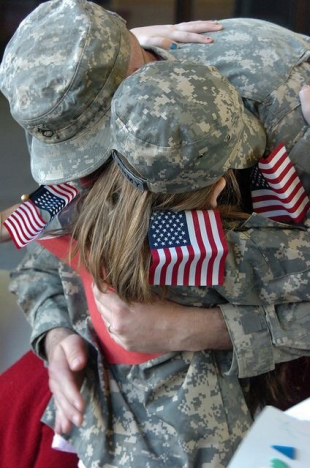 "This benefit acknowledges their service and welcomes them home. 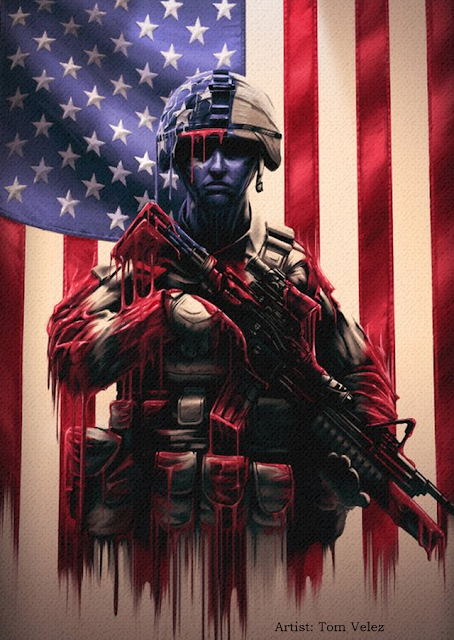 This is something veterans can enjoy the rest of their lives." Every purchase veterans make online will help to improve the quality of life for those who wear the uniform today, Shull noted, as exchange earnings support programs such as combat uniforms below cost, fitness centers, child development centers and youth programs on Army garrisons, Air Force outdoor recreation programs, school lunches for warfighters' children overseas and more. "This is a virtuous cycle," he said. "As a veteran myself, it is an honor to pay forward support to active-duty service members and their families." To verify eligibility and begin shopping, Veterans can visit ShopMyExchange.com. FAYETTEVILLE, N.C (March 15, 2018) — A veteran mistakenly declared dead by the Department of Veterans Affairs is really alive. Charlie Covell is a Vietnam veteran and bronze star recipient. He received his award nearly 40 years after aiding his comrades during an ambush attack in Vietnam. Covell also struggles with COPD, wearing oxygen to cope. At the age of 81, Covell has survived infantry battle in Vietnam, three hospital visits and most recently, a phony flat line. Late last month, Covell's wife noticed his benefit check wasn't deposited. From there, she called the VA.
"That's when they told me that he was deceased and that he had died on the 23rd of January," said Covell. Charles R. Covell died in January in Utica, New York. The Social Security office sent the VA the death certificate for a man who shared the same first and last name. "Social security number was different of course," said Charlie Covell. For weeks, the Covells searched for answers only to run into dead ends. Congressman Richard Hudson's office found out about the mixup on Monday and within 24 hours had Covell reinstated. "Congressman Hudson is able to assist constituents with problems they may be having with a federal agency like the VA. While he and his caseworkers can't force an agency to act in a constituent's favor, they can help facilitate the process, get a fair hearing, and advocate for a positive outcome," said Tatum Gibson, Communications Director for Congressman Richard Hudson. Turns out these errors are pretty rare. According to the Department of Veterans Affairs, between October 2016 and September 2017, the VA suspended benefits for 105,529 total beneficiaries identified by the Social Security Administration as having passed away. Of those, 245 beneficiaries had their benefit awards reactivated due to erroneous suspensions. If a notification of death is received by SSA, VA automatically sends a notification letter to the beneficiary's last known address informing his or her estate or survivors that VA has suspended payment of benefits. This letter provides notice that VA will take action to terminate benefits if the beneficiary does not contact VA regarding an error. VA's adjudication procedures manual provides guidance for claims processors on the actions associated with a third-party notice of death. When an error is identified, VA works diligently to restore VA benefits as quickly as possible and can resume benefits within 24 hours. The Covells have received their missing payment from last month. ABC11 asked Mr. Covell if he holds any hard feelings. "It's amusing. How can you get frustrated with something you don't have any control over? I knew it was a mistake so it had to be amusing," said Covell. Arvin, CA (March 15, 2018) — They served our country fighting for our freedom and today locals gathered at the Bakersfield National Cemetery to pay their respects. Today dozens gathered to pay their respects to nine members of the military, buried here at the Bakersfield National Cemetery, who weren’t given full military honors. That’s because these veterans were buried without any family to pay their respects. This morning that was corrected. 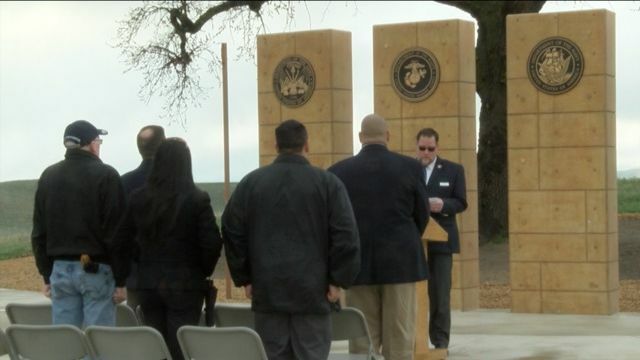 “A lot of times the veterans pass away at the coroner’s office or somewhere where they have no family and what we do is provide them with their benefit of burial service but in the regards of having military honors not being present at the time of their burial,” said William Pickard, the director of the Bakersfield National Cemetery. The cemetery holds this ceremony quarterly throughout the year to give everyone who served the dignified service they deserve. “It’s an honor and a privilege for me to be out here taking care of the veterans and their families, supporting the community here in Bakersfield. I’m a veteran myself and there’s nothing more I like to do than take care of my brothers and sisters in arms and their family members in their most important time of need,” said Pickard. Don Kurtz is an army vet and has been a volunteer speaker at this ceremony for about 15 years. “All veterans deserve this honor, I’m the youngest of six boys and all of us served at one time or another,” said Don Kurtz, an Army vet. Kurtz says that every ceremony he’s done has been very meaningful for him…but one in particular was the most touching. “Only once have I ever completely choked up and that’s because I knew the recipient and the wife…knew her real well. I said her name and it was a minute or two before I could say another one,” said Kurtz. And Kurtz says he plans to salute his fellow brothers and sisters one final time for as long as he can. “When it quits giving me feelings I quit,” said Kurtz.